"New Haven" redirects here. For other uses, see New Haven (disambiguation). 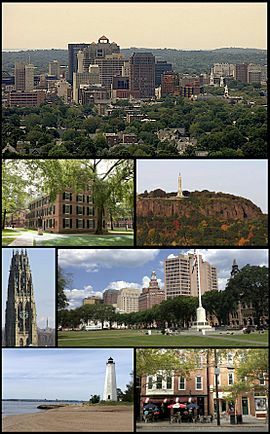 New Haven (local /nuː ˈheɪvən/ noo-HAY-vən), in the U.S. state of Connecticut, is the principal municipality in Greater New Haven, which had a total population of 862,477 in 2010. 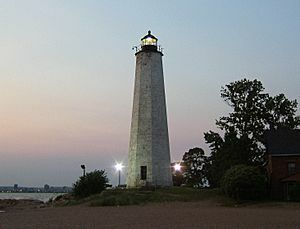 It is located on New Haven Harbor on the northern shore of Long Island Sound in New Haven County, Connecticut, and is part of the New York metropolitan area. 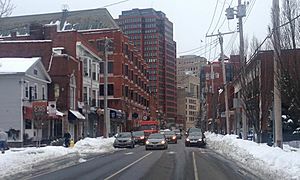 It is the second-largest city in Connecticut (after Bridgeport), with a population of 129,779 people as of the 2010 United States Census. According to a census of 1 July 2012, by the Census Bureau, the city had a population of 130,741. 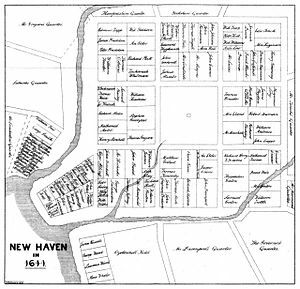 New Haven was founded in 1638 by English Puritans, and a year later eight streets were laid out in a four-by-four grid, creating what is commonly known as the "Nine Square Plan". The central common block is the New Haven Green, a 16-acre (6 ha) square, and the center of Downtown New Haven. 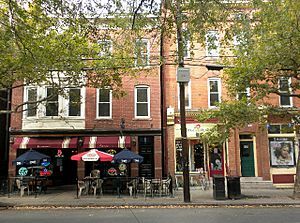 The Green is now a National Historic Landmark and the "Nine Square Plan" is recognized by the American Planning Association as a National Planning Landmark. 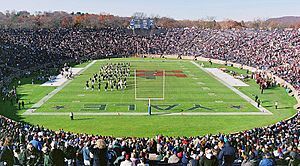 New Haven is the home of Yale University. The university is an integral part of the city's economy, being New Haven's biggest taxpayer and employer. Health care (hospitals and biotechnology), professional services (legal, architectural, marketing, and engineering), financial services, and retail trade also help to form an economic base for the city. 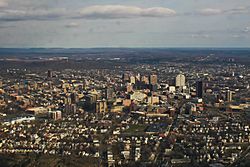 The city served as co-capital of Connecticut from 1701 until 1873, when sole governance was transferred to the more centrally located city of Hartford. 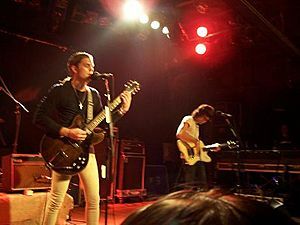 New Haven has since billed itself as the "Cultural Capital of Connecticut" for its supply of established theaters, museums, and music venues. New Haven is also the birthplace of George W. Bush, the 43rd President of the United States. In 1637 a small party of Puritans reconnoitered the New Haven harbor area and wintered over. 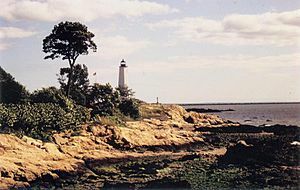 In April 1638, the main party of five hundred Puritans who left the Massachusetts Bay Colony under the leadership of the Reverend John Davenport and the London merchant Theophilus Eaton sailed into the harbor. 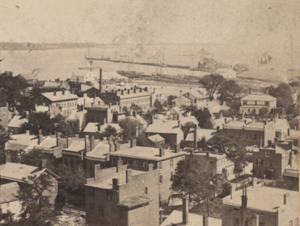 These settlers were hoping to establish a (in their mind) better theological community, with the government more closely linked to the church than the one they left in Massachusetts and sought to take advantage of the excellent port capabilities of the harbor. The Quinnipiacs, who were under attack by neighboring Pequots, sold their land to the settlers in return for protection. By 1640, the town's theocratic government and nine-square grid plan were in place, and the town was renamed Newhaven from Quinnipiac. However, the area north of New Haven remained Quinnipiac until 1678, when it was renamed Hamden. 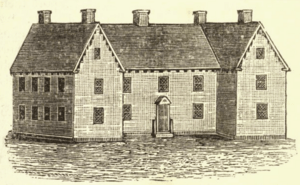 The settlement became the headquarters of the New Haven Colony. 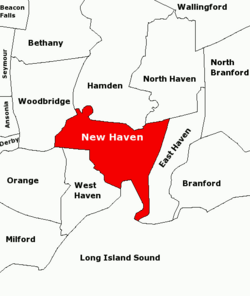 At the time, the New Haven Colony was separate from the Connecticut Colony, which had been established to the north centering on Hartford. One of the principal differences between the two colonies was that the New Haven colony was an intolerant theocracy that did not permit other churches to be established, while the Connecticut colony permitted the establishment of other churches. Economic disaster struck the colony in 1646, however, when the town sent its first fully loaded ship of local goods back to England. This ship never reached the Old World, and its disappearance stymied New Haven's development in the face of the rising trade power of Boston and New Amsterdam. In 1660, founder John Davenport's wishes were fulfilled, and Hopkins School was founded in New Haven with money from the estate of Edward Hopkins. New Haven became part of the Connecticut Colony in 1664, when the two colonies were merged under political pressure from England, according to folklore as punishment for harboring the three judges (in reality, done in order to strengthen the case for the takeover of nearby New Amsterdam, which was rapidly losing territory to migrants from Connecticut). Some members of the New Haven Colony seeking to establish a new theocracy elsewhere went on to establish Newark, New Jersey. 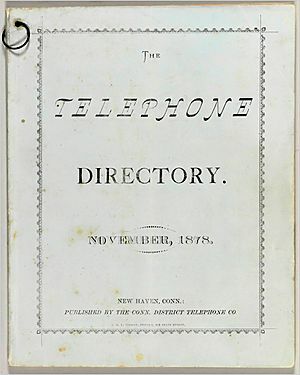 It was made co-capital of Connecticut in 1701, a status it retained until 1873. 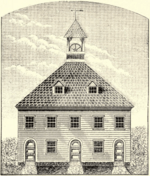 In 1716, the Collegiate School relocated from Old Saybrook to New Haven and established New Haven as a center of learning. In 1718, the name of the Collegiate School was changed to Yale College in response to a large donation from British East India Company merchant Elihu Yale, former Governor of Madras. On July 5, 1779, 2,600 loyalists and British regulars under General William Tryon, governor of New York, landed in New Haven Harbor and raided the 3,500-person town. A militia of Yale students had been prepping for battle, and former Yale president and Yale Divinity School professor Naphtali Daggett rode out to confront the Redcoats. Yale president Ezra Stiles recounted in his diary that while he moved furniture in anticipation of battle, he still couldn't quite believe the revolution had begun. New Haven was not torched as the invaders did with Danbury in 1777, or Fairfield and Norwalk a week after the New Haven raid, so many of the town's colonial features were preserved. 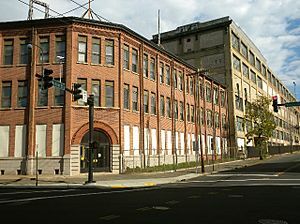 New Haven's expansion continued during the two World Wars, with most new inhabitants being African Americans from the American South and Puerto Ricans. The city reached its peak population after World War II. The area of New Haven is only 17 square miles (44 km2), encouraging further development of new housing after 1950 in adjacent, suburban towns. Moreover, as in other U.S. cities in the 1950s, New Haven began to suffer from an exodus of middle-class workers. In 1954, then-mayor Richard C. Lee began some of the earliest major urban renewal projects in the United States. Certain sections of downtown New Haven were redeveloped to include museums, new office towers, a hotel, and large shopping complexes. Other parts of the city were affected by the construction of Interstate 95 along the Long Wharf section, Interstate 91, and the Oak Street Connector. The Oak Street Connector (Route 34), running between Interstate 95, downtown, and The Hill neighborhood, was originally intended as a highway to the city's western suburbs but was only completed as a highway to the downtown area, with the area to the west becoming a boulevard (See "Redevelopment" below). From the 1960s through the late 1990s, central areas of New Haven continued to decline both economically and in terms of population despite attempts to resurrect certain neighborhoods through renewal projects. In conjunction with its declining population, New Haven experienced a steep rise in its crime rate. 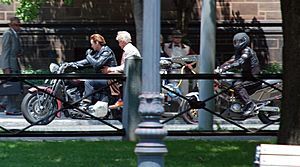 In 2010, New Haven ranked as the 18th most dangerous city in America, albeit with crime rating under the significant safety benchmark of 200.00. 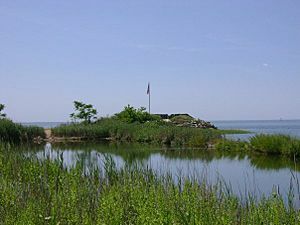 New Haven's best-known geographic features are its large deep harbor, and two reddish basalt trap rock ridges which rise to the northeast and northwest of the city core. These trap rocks are known respectively as East Rock and West Rock, and both serve as extensive parks. 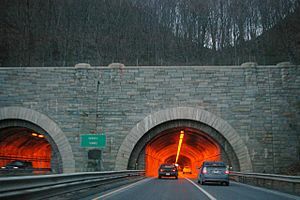 West Rock has been tunneled through to make way for the east-west passage of the Wilbur Cross Parkway (the only highway tunnel through a natural obstacle in Connecticut), and once served as the hideout of the "Regicides" (see: Regicides Trail). Most New Haveners refer to these men as "The Three Judges". East Rock features the prominent Soldiers and Sailors war monument on its peak as well as the "Great/Giant Steps" which run up the rock's cliffside. Downtown New Haven, occupied by nearly 7,000 residents, has a more residential character than most downtowns. The downtown area provides about half of the city's jobs and half of its tax base and in recent years has become filled with dozens of new upscale restaurants, several of which have garnered national praise (such as Ibiza, recognized by Esquire and Wine Spectator magazines as well as the New York Times as the best Spanish food in the country), in addition to shops and thousands of apartments and condominium units which subsequently help overall growth of the city. 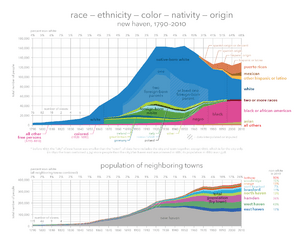 Graph of New Haven demographics from the US Census, 1790–2010. The U.S. Census Bureau reports a 2010 population of 129,779, with 47,094 households and 25,854 families within the city of New Haven. The population density is 6,859.8 people per square mile (2,648.6/km²). There are 52,941 housing units at an average density of 2,808.5 per square mile (1,084.4/km²). The racial makeup of the city is 42.6% White, 35.4% African American, 0.5% Native American, 4.6% Asian, 0.1% Pacific Islander, 12.9% from other races, and 3.9% from two or more races. Hispanic or Latino residents of any race were 27.4% of the population. Non-Hispanic Whites were 31.8% of the population in 2010, down from 69.6% in 1970. The city's demography is shifting rapidly: New Haven has always been a city of immigrants and currently the Latino population is growing rapidly. Previous influxes among ethnic groups have been African-Americans in the postwar era, and Irish, Italian and (to a lesser degree) Slavic peoples in the prewar period. A study of New Haven's demographics, based on age, educational attainment, and race and ethnicity, found that its demographics were the closest of any American city to the national average. New Haven's greatest culinary claim to fame may be its pizza, which has been claimed to be among the best in the country, or even in the world. New Haven-style pizza, called "apizza" (pronounced ah-BEETS, IPA: [aˈpitts] in the original Italian dialect), made its debut at the iconic Frank Pepe Pizzeria Napoletana (known as Pepe's) in 1925. Apizza is baked in coal- or wood-fired brick ovens, and is notable for its thin crust. Apizza may be red (with a tomato-based sauce) or white (with a sauce of garlic and olive oil), and pies ordered "plain" are made without the otherwise customary mozzarella cheese (originally smoked mozzarella, known as "scamorza" in Italian). 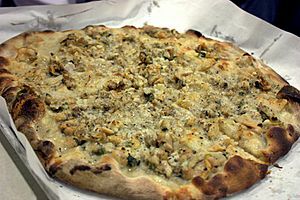 A white clam pie is a well-known specialty of the restaurants on Wooster Street in the Little Italy section of New Haven, including Pepe's and Sally's Apizza (which opened in 1938). Modern Apizza on State Street, which opened in 1934, is also well-known. New Haven is home to Miya's Sushi, the first sustainable sushi restaurant in the world. Miya's offers the largest vegetarian sushi menu in the world. 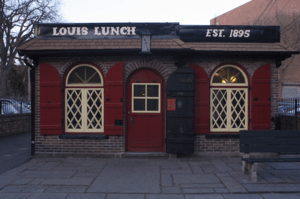 During weekday lunchtime, over 150 lunch carts and food trucks from neighborhood restaurants cater to different student populations throughout Yale's campus. The carts cluster at three main points: by Yale – New Haven Hospital in the center of the Hospital Green (Cedar and York streets), by Yale's Trumbull College (Elm and York streets), and on the intersection of Prospect and Sachem streets by the Yale School of Management. Popular farmers' markets, managed by the local non-profit CitySeed, set up shop weekly in several neighborhoods, including Westville/Edgewood Park, Fair Haven, Upper State Street, Wooster Square, and Downtown/New Haven Green. The city hosts numerous theatres and production houses, including the Yale Repertory Theatre, the Long Wharf Theatre, and the Shubert Theatre. There is also theatre activity from the Yale School of Drama, which works through the Yale University Theatre and the student-run Yale Cabaret. Southern Connecticut State University hosts the Lyman Center for the Performing Arts. The shuttered Palace Theatre (opposite the Shubert Theatre) is being renovated and will reopen as the College Street Music Hall in May, 2015. Smaller theatres include the Little Theater on Lincoln Street. Cooperative Arts and Humanities High School also boasts a state-of-the-art theatre on College Street. The theatre is used for student productions as well as the home to weekly services to a local non-denominational church, the City Church New Haven. The Shubert Theatre once premiered many major theatrical productions before their Broadway debuts. Productions that premiered at the Shubert include Oklahoma! (which was also written in New Haven), Carousel, South Pacific, My Fair Lady, The King and I, and The Sound of Music, as well as the Tennessee Williams play A Streetcar Named Desire. 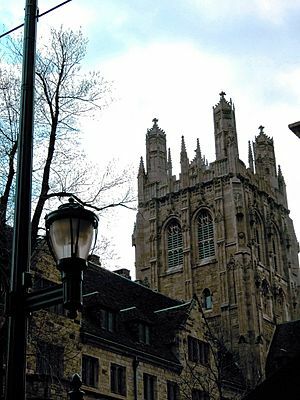 New Haven has a variety of museums, many of them associated with Yale. The Beinecke Rare Book and Manuscript Library features an original copy of the Gutenberg Bible. There is also the Connecticut Children's Museum; the Knights of Columbus museum near that organization's world headquarters; the Peabody Museum of Natural History; the Yale University Collection of Musical Instruments; the Eli Whitney Museum (across the town line in Hamden, Connecticut, on Whitney Avenue); the Yale Center for British Art, which houses the largest collection of British art outside the U.K., and the Yale University Art Gallery, the nation's oldest college art museum. 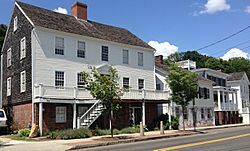 New Haven is also home to the New Haven Museum and Historical Society on Whitney Avenue, which has a library of many primary source treasures dating from Colonial times to the present. In addition to the Jazz Festival (described above), New Haven serves as the home city of the annual International Festival of Arts and Ideas. New Haven's Saint Patrick's Day parade, which began in 1842, is New England's oldest St. Patty's Day parade and draws the largest crowds of any one-day spectator event in Connecticut. The St. Andrew the Apostle Italian Festival has taken place in the historic Wooster Square neighborhood every year since 1900. Other parishes in the city celebrate the Feast of Saint Anthony of Padua and a carnival in honor of St. Bernadette Soubirous. New Haven celebrates Powder House Day every April on the New Haven Green to commemorate the city's entrance into the Revolutionary War. The annual Wooster Square Cherry Blossom Festival commemorates the 1973 planting of 72 Yoshino Japanese Cherry Blossom trees by the New Haven Historic Commission in collaboration with the New Haven Parks Department and residents of the neighborhood. The Festival now draws well over 5,000 visitors. The Film Fest New Haven has been held annually since 1995. New Haven is served by the daily New Haven Register, the weekly "alternative" New Haven Advocate (which is run by Tribune, the corporation owning the Hartford Courant), the online daily New Haven Independent, and the monthly Grand News Community Newspaper. Downtown New Haven is covered by an in-depth civic news forum, Design New Haven. The Register also backs PLAY magazine, a weekly entertainment publication. The city is also served by several student-run papers, including the Yale Daily News, the weekly Yale Herald and a humor tabloid, Rumpus Magazine. WTNH Channel 8, the ABC affiliate for Connecticut, WCTX Channel 59, the MyNetworkTV affiliate for the state, and Connecticut Public Television station WEDY channel 65, a PBS affiliate, broadcast from New Haven. All New York City news and sports team stations broadcast to New Haven County. Grove Street Cemetery, a National Historic Landmark which lies adjacent to Yale's campus, contains the graves of Roger Sherman, Eli Whitney, Noah Webster, Josiah Willard Gibbs, Charles Goodyear and Walter Camp, among other notable burials. The cemetery is known for its grand Egyptian Revival gateway. The Union League Club of New Haven building, located on Chapel Street, is notable for not only being a historic Beaux-Arts building, but also is built on the site where Roger Sherman's home once stood; George Washington is known to have stayed at the Sherman residence while President in 1789 (one of three times Washington visited New Haven throughout his lifetime). 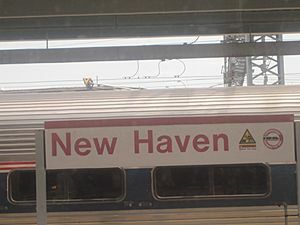 New Haven is connected to New York City by commuter rail, regional rail and inter-city rail, provided by Metro-North Railroad (commuter rail), Shore Line East (commuter rail), and Amtrak (regional and intercity rail) respectively, allowing New Haven residents to commute to work in New York City (just under two hours by train). The city's main railroad station is the historic Beaux-arts Union Station, which serves Metro-North trains to New York and Shore Line East commuter trains to New London. An additional station was opened in 2002, named State Street Station, to provide Shore Line East and a few peak-hour Metro-North passengers easier access to and from Downtown. Union Station is further served by four Amtrak lines: the Northeast Regional and the high-speed Acela Express provide service to New York, Washington, D.C. and Boston, and rank as the first and second busiest routes in the country; the New Haven–Springfield Line provides service to Hartford and Springfield, Massachusetts; and the Vermonter provides service to both Washington, D.C., and Vermont, 15 miles (24 km) from the Canada–US border. Amtrak also codeshares with United Airlines for travel to any airport serviced by United Airlines, via Newark Airport (EWR) originating from or terminating at Union Station, (IATA: ZVE). Metro-North has the third highest daily ridership among commuter rails in the country, with an average weekday ridership of 276,000 in 2009. Of the 276,000 Metro-North riders, 112,000 rode the New Haven Line each day, which would make the New Haven Line seventh in the country in daily ridership if it were alone an entire commuter rail system. Shore Line East ranked nineteenth in the country, with an average daily ridership of 2,000. 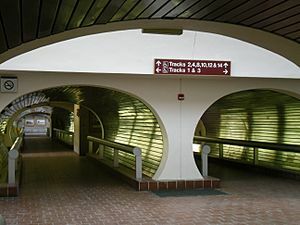 Additionally, the Connecticut Department of Transportation plans to add a new commuter service called the Hartford Line in collaboration with Amtrak and the federal government that will run between New Haven and Springfield, Massachusetts with a terminus at Union Station in Downtown New Haven. As of late 2015, funding had been secured and the service is scheduled to begin operation in early 2018. The New Haven Division of Connecticut Transit (CT Transit), the state's bus system, is the second largest division in the state with 24 routes. All routes originate from the New Haven Green, making it the central transfer hub of the city. Service is provided to 19 different municipalities throughout Greater New Haven. The New Haven Division buses follow routes that had originally been covered by trolley service. Horse-drawn steetcars began operating in New Haven in the 1860s, and by the mid-1890s all the lines had become electric. In the 1920s and 1930s, some of the trolley lines began to be replaced by bus lines, with the last trolley route converted to bus in 1948. The City of New Haven is in the very early stages of considering the restoration of streetcar (light-rail) service, which has been absent since the postwar period. New Haven lies at the intersection of Interstate 95 on the coast—which provides access southwards and/or westwards to the western coast of Connecticut and to New York City, and eastwards to the eastern Connecticut shoreline, Rhode Island, and eastern Massachusetts—and Interstate 91, which leads northward to the interior of Massachusetts and Vermont and the Canada–US border. I-95 is infamous for traffic jams increasing with proximity to New York City; on the east side of New Haven it passes over the Quinnipiac River via the Pearl Harbor Memorial, or "Q Bridge", which often presents a major bottleneck to traffic. I-91, however, is relatively less congested, except at the intersection with I-95 during peak travel times. Tweed New Haven Regional Airport is located within the city limits 3 miles (5 km) east of the business district, and provides daily service to Philadelphia through American Eagle. Bus service between Downtown New Haven and Tweed is available via the CT Transit New Haven Division Bus "G". Taxi service and rental cars (including service by Hertz, Avis, Enterprise and Budget) are available at the airport. Travel time from Tweed to downtown takes less than 15 minutes by car. In June 17, 2013, the city commissioned the Nathan Hale, a 36 foot (11 m) Port Security vessel capable of serving search and rescue, firefighting, constabulary roles. Yale's Sterling Memorial Library, Interior. Mansfield St. New Haven, home to the Marsh Botanical Garden and this abandoned building. New Haven, Connecticut Facts for Kids. Kiddle Encyclopedia.